Welsh quilts, Durham quilts and the British tradition of bellringing. I am a quilter living in Woodbridge, Suffolk who has made quilts since I was a teenager. I also ring bells! Both are great British traditions....I will try to feature some of my antique Welsh and Durham quilts, the quilts I make myself, my quilting activities and also some of my bellringing achievements. Plus as many photos as I can manage. NB: Double click on the photos to see greater detail, then use back button to return to the main page. The Traditional Quilt class was larger and more varied this year. Here is the winning traditional quilt, Euphoria by Deborah Kemball of Quebec. Similar to last years quilt but with a dark not red background. This was a very beautiful quilt - it is Komorebi by Shizuyo Morishita of Tokyo. All handmade with lovely piecing and quilting. I especially liked the colours and the use of embroidery for embellishment and emphasis. Second in Traditional quilts. Here is the third place quilt, Greek Fossils by Ferret. Thanks for the photos, Liz. This is a wholecloth quilt, all hand guided longarm quilting. Faux trapunto by using two layers of wool wadding. Hand dyed cotton sateen, with changes of thread colour to form the design. Detail of Ferret's quilt, so that you can see the effect of the different thread colours. I think that this is another Japanese quilt, Flower of 13115 Pieces and Peace, made by Hiromi Yokota of Yokohama. Another show stopper that always had a crowd around it. This was the first quilt to be seen inside the Festival of Quilts doors - the lighting was not as good as it should have been - I am not sure who this is by, but it is papercut blocks in red and white. Very nicely done applique with some great quilting, again attracting a lot of attention. Again, not sure who made this but a very colourful quilt. Lovely use of striped fabrics - where did they all come from? Beautiful detail from the quilt above. Not very many wholecloths this year - here is I Love Feathers by Sheila Curtis of Ledbury. Oakshott fabric and variegated thread by King Tut, wool wadding. From a Lilian Hedley workshop using a variety of published patterns together with her own. And here is Andrea Strache's quilt Peridot. I am sorry that I could not get a good photo of this, I did try all the settings on my camera! Quilting is hard to photograph, especially with poor lighting. The lovely gentle green may not have helped, either. Design after a RIB quilt by Miss Evans in 1930. Another large and spectacular quilt. The Jug quilt by Clare Kingslake of Lechlade. The gentle colours were again difficult to photograph. Hand applique with lots of embroidery using perle thread. This got a commendation. Does anyone remember the uproar over the Patchwork Championship's Best in Show many years ago? It was a creative but very poorly made student quilt - people started to pin notes onto the quilt and the organisers had to reposition it out of reach. A few of the winning quilts from Festival of Quilts 2012. A new feature this year was a "winners' wall" which seemed very popular although there were some grumbles that the quilts had been separated from their classes. This quilt won the best group quilt and later the best in show. It is made by The Group with No Name and is called The Quilters Games. It shows Sunbonnet Sue at the 2012 Olympic Games. A popular choice, but not with all, one lady came up to our stand to say that it was disgusting and what would the world think? Most people were amused and of course the quilt was timely. The group members were very pleased at the win and were full of plans for next year - last year they made the very popular Meerkat group quilt. 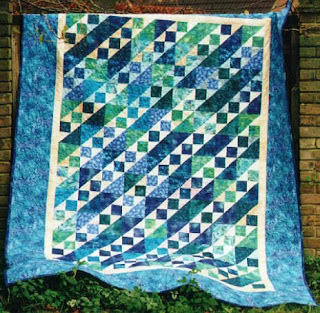 Winner pictorial - a quilt by Janneke de Vries Bodzinga called Graceful Dance. This lady won Best in Show last year.....sorry that the image is not cropped, I am using a laptop which does not have the same software as my large computer. ..and here is a photo of Ferret wearing her Phoenix coat. I had meant to photograph her Greek Fossils wholecloth quilt, but there were simply too many people looking at it. Lovely use of different coloured threads on the longarm machine. I am back from the Festival of Quilts - and just about recovered. This year was just as busy as previous years, although it remains to be seen if attendance was as good and if people spent as much money! This show has been sold to another company, so we may see some changes over the coming years. My entry this year was my Hawaiian quilt Piillani, a Poakalani pattern from the thirties. Piillani was one of the greatest Hawaiian kings, and the ancestor of many kings including King Kamehameha the Great. This show is so large, the standard so high and the awards so few, that I never expect to win anything. But I do find the judges comments very interesting (these are pinned to the back of the quilt on its return). This year one of the two judges marked everything as Excellent except the quilting and edge treatment which were only good. "Striking with its stark contrast and impeccable technique". The other judge marked everything good except for quilting and edge treatment which were excellent. "A stiking choice of design, really well made and finished. Perhaps the brown area is just a little "heavy" could be finer?" This puzzled me as the quilt is purple and cream but I guess she is refering to the cream background quilting? Anyhow, judging is a delicate and personal matter. I am just happy to participate. I spent most of my time at the British Quilt Study Group table. My two Turkey red quilts are hanging up, they were returned from Scotland in time to take along. As the York Quilt Museum in the stand next door was having a display of turkey red quilts, this worked well. Also, our group had made a real effort to publish a small booklet on turkey red - this was priced at only £1.50. 150 copies were printed and I think we were left with only 5 copies, so that was a success! The group is thinking about another booklet next year to accompany the museum's display. The Quilters Haven/Karin Hellaby stand - in a new location this year, with much more room surounding it. I was able to share a room again with Teresa at a hotel in Solihull which was pleasant and affordable. This year I also went bellringing - I went to a Thursday night practice at Shirley - then I went to Sunday morning ringing at Solihull. I got a warm welcome at both. ...and I also bought these American books on heritage projects in Virginia and Wisconsin, together with one on the Henry Ford Museum collection. I also bought this book on African wax fabrics. One brand of these fabrics were formerly manufactured in the UK, but are now designed in Manchester and made in Ghana. However, they are being overtaken by the cheaper plain printed fabrics from China. I also went to four lectures this year which I very much enjoyed - Dorothy Osler, Jonathan from the International Quilt Study Center in Nebraska, Jane Sassaman and Bettina Havig. More photos of quilts to folllow. Just a quick post to say that I am off to the Festival of Quilts at the NEC in Birmingham. I will be at the BQSG stand near the front, with some Turkey Red quilts .Come and visit if you are there! On Saturday, Mike and I were invited to the wedding of two of our ringers, Ruth Eagle and Richard Munnings. Luckily, it was a beautiful sunny day for the wedding! In the morning, we rang an quarter at our own tower, St. Mary's, Pettistree. Then at 12.30 it was off to St Mary's in Woodbridge. This is a much larger church and has a heavy ring of eight bells. Nearby is the Abbey School, where my son Tom attended school many years ago! Needless to say, there was a lot of bellringing both before and after the wedding ceremony. Richard even came up to the ringing chamber before hand - here he is (on the left) ringing the seventh to a half course of Yorkshire major. Ruth looked very fetching in her beaded dress, white with purple accents. Of course, my present was a quilt. Since Richy is a "Tractor Boy" fan (aka Ipswich Town Football Club) the main colours had to be blue and white. 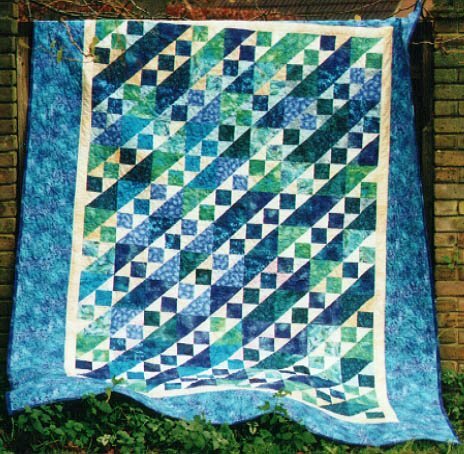 This is a quick quilt that uses the technique known as Mary's triangles. On Sunday, I went to London to visit my daughter Sophie; we went to see the V &A exhibition on Ballgowns. I also enjoyed seeing the collection of clothing and dresses. The Olympic marathon was proving very popular that day, as it was taking place at the Embankment, and was one of the few events that did not require tickets (a very scarce commodity). My train ran right beside the Olympic stadium...it was good to see the volunteers dotted around London helping tourists and visitors. One of Sophie's friends from school gave up two weeks of his holidays and spent the time driving athletes and officials around town! I am relieved that the Olympics went off well and seems to have been a good success. Other news - this blog has now had over 100,000 views - many thanks to all. And. I will be going to visit my mother in Gainesville Florida for a week from 18 September - so if there are any quilt enthusiasts there I would be pleased to hear from you. I hope to take in the Jacksonville Quiltfest while I am there! Here are the final photos that I took at "A Quilted Bridge - The Amish -Welsh Connection" which is being held at the Welsh Quilt Centre in Lampeter, Ceredigion, Wales through 3 November. Lampeter Valfrey Tailors Sample Quilt - made from flannel and shirting - machine pieced, hand quilted. About 1895. A beautiful and striking quilt. Double sided Welsh Patchwork, Cardigan, made from flannel. Hand pieced and quilted. 1st half 19th C.
Two strippies - The hanging one is Amish, and the one on the bed is Welsh. 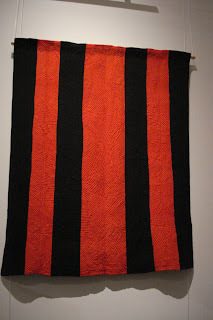 Amish Bars quilt on loan from the American Museum in Britain, Lancaster County, PA, c 1880. Thin wool with a thin cotton batting. Pieced by machine and hand quilted. ...but I thought that you would like to see the difference in the quilting. The Welsh quilt has a thick wadding/batting so the quilting stitches are larger. Whereas the Amish quilt has thin batting and much smaller quilting stitches, in brown cotton. The thought is, that the Amish (like the Welsh) needed warm bedding, but in the Scandinavian/German tradition, used duvets on the bed, so thinner quilts on top were satisfactory. The Welsh did not use duvets, so used the local wool flannel and wool wadding to make really thick and warm quilts. But the abstract design, the intense colour and plain cloth surfaces embellished with quilting are common to the quilts of both groups. Jen Jones can be contacted at quilts@jen-jones.com or 01570-422088. A catalogue for the exhibition is available at £5 plus postage and packing. Her website at www.welshquilts.com contains all information on the Quilt Centre and its environs. More photos from the Exhibition "A Quilted Bridge - The Amish Welsh Connection", at the Welsh Quilt Centre in Lampeter, Wales. This exhibition runs through to 3 November 2012 and is well worth seeing if you are planning a visit to Wales. The Butterfly Quilt, so named for the unusual shape in the centre of the quilt. Wool, cotton, paisley shawl and silk, cotton wadding. C 1880. 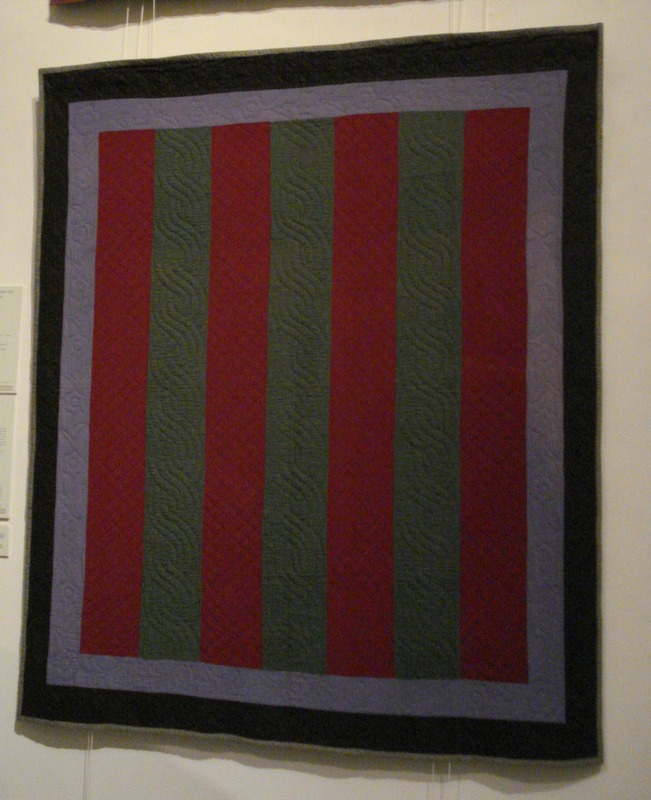 This photo is very dark, the quilt is more vividly purple and green in real life. Amish floating Bars Quilt, Ohio. Wool and cotton, with a thin cotton batting. Machine sewn and hand quilted. About 1900. On loan from the American Museum in Britain. Not in the catalogue - a Welsh flannel quilt. Another geometric Welsh flannel quilt from Jen's collection. The quilt that is on the catalogue cover - Lledrod Bow Tie Quilt - Satin cotton patchwork with strippy reverse. Piecing is by machine and the quilting is entirely by hand. The filling is an old blanket. C 1900. the strippy reverse is irregular, with the strips punctuated with rectangles. Stitching patterns are random, adding up to a mad, random pattern. Treorchy Quilt - Flannel, pyjama fabric and cotton. Machine pieced and hand quilted. Late 19th or early 20th c. One of a pair of quilts found by Jen in the South Wales valleys in the 1980's. The same quilt in its setting in the exhibition - I liked the use of the old iron bedsteads to show the quilts. 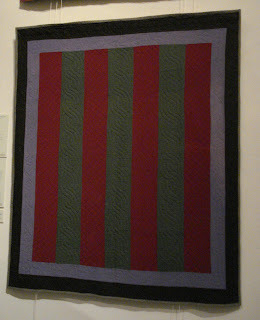 Cot quilt in a cradle. Red Crosses Quilt - Rhayader, Powys. Wool, flannel and velvet. Machine stitched. Higgledy-piggledy placement makes this quilt charmingly quaint. About 1890. As I have said before, an attractive catalogue is available for£5.00 plus postage and packing. Email quilts@jen-jones.com for a quote. More information at www.jen-jones.com or www.welshquilts.com. Please telephone 01570-422088 for opening times on public holidays or if coming a long way, as opening times do vary. I continue with photos taken at the Welsh Quilt Centre's Exhibition "A Quilted Bridge - the Amish Welsh Connection"
I notice that Dorothy Olser will be giving two lectures on this subject at the Festival of Quilts later this month - well worth attending! 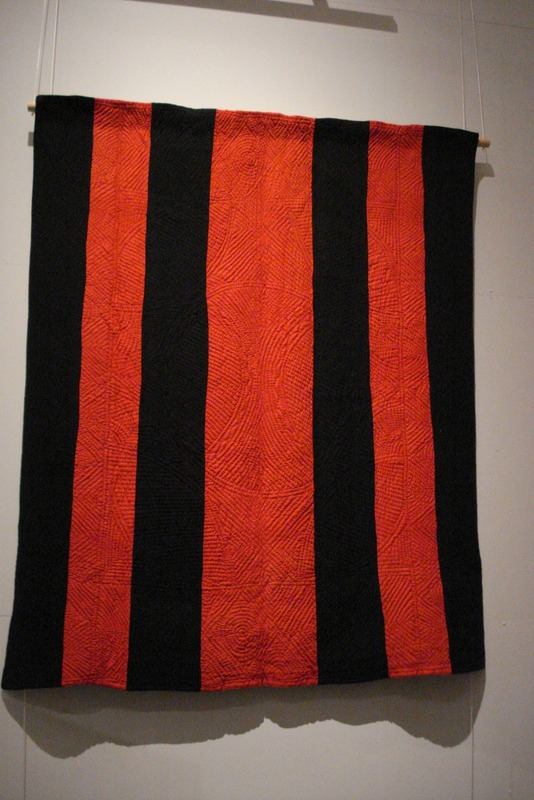 The Ogof quilt - made 2nd half of the 19th C by Benjamin Jones of Ogof Mill. The photo in the catalogue gives a lighter cast to the fabrics, but in the Town Hall, the colours looked very rich. A detail of the corner of the quilt, showing the quilting stitches and the woollen fabrics. Sign that accompanied this quilt, showing an old photo and the weaving shed where some of the fabrics were woven. This quilt made me wonder about the quilt found in the attic in Llannelli - very worn - but perhaps a similar age as this quilt? Red flannel quilt from Gorsgoch, Cardiganshire - circa 1880 - the reverse of this quilt is green flannel. And on the bed, the Central Star Quilt from Llanrhystud c 1870. One of my favourite quilts, with fantastic quilting - Bold Blue and Beige Patchwork from Heidrim Carmarthenshire. A mix of hand and machine piecing.Generally, Welsh quilting disregards the patchwork boundaries and treats the quilt as a wholecloth. This quilts breaks all the rules, except at the corners. c 1890. Made of fine wool. And the bottom of the quilt- beautiful!! Primitive Welsh Flannel patchwork. Drefach near Lampeter. Flannel and wool, blanket inside. around 1800 - an early quilt. Classic Amish Centre Diamond in a Square - Lancaster County, Pennsylvania - 1920-1930. Wool backed by plain green cotton. Thin cotton wadding,pieced by machine and hand quilted. On loan from the American Museum in Britain. I live in Woodbridge Suffolk, and work as a teacher and bookkeeper. Born in Princeton New Jersey, I went to Smith College and Durham University where I studied Biology. I then went to Kings College London where I did research in Quaternary Ecology. For 17 years, I taught Environmental Science at Suffolk College. I am a member of the Quilters Guild, The British Quilt Study Group, The Traditional Quilt Group, and The Suffolk Guild of Bellringers. I also enjoy walking. I have a strong interest in nature conservation and belong to the Suffolk Wildlife Trust. I am also an expert in alternative energy, on which I have written several books. I have two adult children. I have two cats.